I don’t know why it took me so long to discover one of the most darling Turkish gift stores in Istanbul. 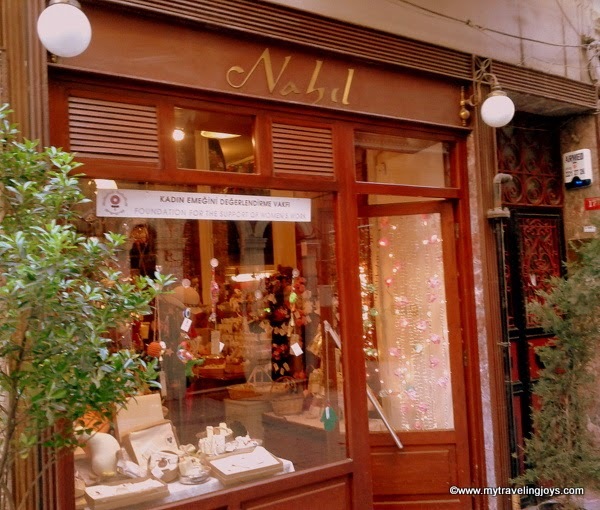 Located in the heart of Taksim, just a few steps from bustling Istiklal Caddesi, you’ll find the small storefront of Nahıl Dükkan. Here you can buy all kinds of homemade gifts, such as aprons, table cloths, lavender sachets, children’s toys, coin purses and natural soaps, and support a great cause. Since 2008, Nahıl Dükkan in Istanbul has been selling products made by low-income women in Turkey. The store is supported by Kadın Emeğini Değerlendirme Vakfı (KEDV), a non-profit organization, established in 2003. KEDV’s goal was to establish a platform from which women throughout Turkey could sell their handicrafts, which would then help empower them economically. The Istanbul store also sells vintage and second-hand clothes and books. The word Nahıl means to help each other and also is the name of a tree which symbolizes bereket, a Turkish word that translates loosely as bountiful blessings. At Nahıl Dükkan, I stocked up on several lavender sachet bags featuring cute designs such as the historic Tünel tram, Turkish tulips, Galata Tower and cats for only 4 tl each. I always like to keep a variety of gift items at home so I quickly can put together small gift bags for friends. In addition to these lavender sachets, I found a sweet purple cloth-covered headband for my niece. I also picked up a darling handmade cotton apron with a hand-stitched angel on it for only 30 tl. I love aprons! I try to buy one wherever we travel to remind me of that destination. 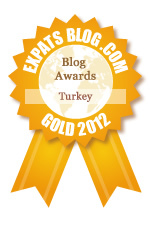 My collection includes ones from our trips to Bologna, Rome, New Orleans (where we were married) and of course, Istanbul. Nahıl’s bright designs are a mix of modern and traditional, with all items being handmade and hand-loomed. You’ll find some beautiful, colorful Turkish peştemal (light hamam towels), hamam accessories, hand-embroidered scarves, Turkish olive oil and natural olive oil soaps, which are made in Mardin, a city in southeastern Turkey. If you’re a tourist, this a wonderful place to buy some Turkish “must buy” gifts to take home – at reasonable prices - and to support a great cause! These larger lavender sachets will make great gifts for my kitty-loving friends. And if you live in Istanbul like I do, you should definitely stop by Nahıl Dükkan to see what homemade items you can’t live without too! According the website, KEDV has established a number of workshops and cooperatives throughout Turkey, assisting more than 10,000 women and children, with a focus on low-income areas that have limited economic opportunities. The profits from these projects are then used to provide children’s education materials, to open new children’s nurseries and handicraft workshops and support social entrepreneurship. What a great discovery! I will definitely use this. Thank you (as always) for the tip. You commented about this on one of my posts, thanks for the description. @Julia, you're welcome! There's so many cute gift ideas in the shop. I'm sure your little ones and anyone's children you know would love it too! what a cool place. i would love to shop there! I love Nahil! They have the cutest little woolen sheep! @Joyce and Moe, yes it's a great place! Love the apron,I have lots too. Lovely shop must have been a pleasure to shop in.